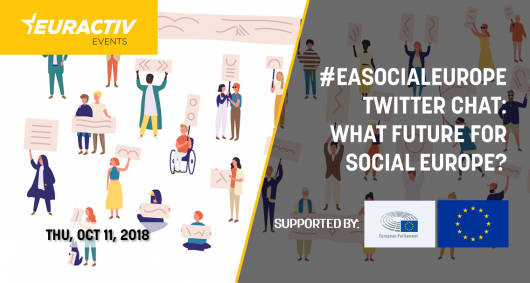 #eaSocialEurope Twitter Chat: What future for Social Europe? Building a ‘Social Europe’ was one of the promises of the Jacques Delors Commission in the late 1980s, spawning a raft of new laws that established a safety net for Europeans at work. Previous European Commissions have focused on regulating working time and protecting the rights of temporary and agency workers. However, the rise of self-employment and the ‘gig economy’, with citizens taking on a number of different jobs, poses new challenges to law-makers. Millions of Europeans enjoy the flexibility of being able to control their working hours, but there are widespread concerns that the 'gig economy' leads to exploitation and low wages. In an age of flexible working, high youth unemployment and low wage growth, how can the EU reinvigorate the promise of a Social Europe that protects workers as well as companies? Can European labour laws and social protection be adapted to this new era of flexible working to provide protection from unscrupulous employers without stifling the flexibility that many Europeans enjoy? Or is Social Europe just an outdated slogan from the analogue age? Q1. Does the concept of Social Europe still exist or is a relic of the last generation? Q2. What should be the social policy priorities of the next Commission? Q3. Should the EU attempt to regulate the ‘gig economy’ and, if so, how? Q4. How can workers' rights and participation be protected in the digital age? Q5. Should the EU consider introducing a universal basic income for citizens? A Twitter Chat is a discussion between Twitter users that get online at a pre-arranged date and time to discuss a specific topic that uses a designated #hashtag (for this chat it’s #eaSocialEurope). The host of the Twitter Chat posts questions that are usually identified as Q1, Q2 and so on, to prompt answers, which are usually identified as A1, A2 and so on, from the participants. The host of this edition will be @eaPolitics, so make sure to follow the account. Twitter Chats usually last about an hour. The hashtag links the questions and answers in a virtual conversation. The best way to see the entire conversation is to search for the hashtag #eaSocialEurope on twitter and switch to the "latest tweets" tab. Please let us know that you intend to join this online Twitter discussion by tweeting at @eaPolitics and mentioning “#eaSocialEurope chat” or sending us a message @eaPolitics.